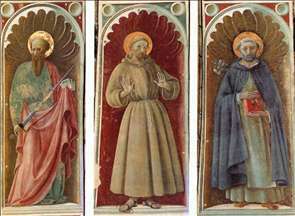 Florentine painter whose work attempted uniquely to reconcile two distinct artistic styles - the essentially decorative late Gothic and the new heroic style of the early Renaissance. Probably his most famous paintings are three panels representing The Rout of San Romano (mid-1450s). His careful and sophisticated perspective studies are clearly evident in The Flood (1447-48). By the time Paolo was 10 years old he was already an apprentice in the workshop of the sculptor Lorenzo Ghiberti, who was then at work on what became one of the supreme masterpieces of the history of art - the bronze doors for the Baptistery of the Florence cathedral, which consisted of 28 panels illustrating New Testament scenes of the life of Christ. In 1414 Uccello joined the confraternity of painters (Compagnia di S. Luca), and in the following year he became a member of the Arte dei Medici e degli Speziali, the official guild to which painters belonged. 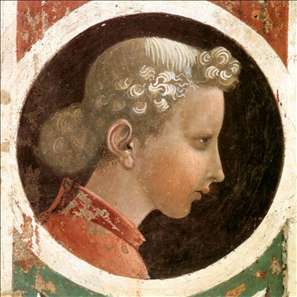 Though Uccello must by then have been established as an independent painter, nothing of his work from this time remains, and there is no definite indication of his early training as a painter, except that he was a member of the workshop of Ghiberti, where many of the outstanding artists of the time were trained. Uccello s earliest, and now badly damaged, frescoes are in the Chiostro Verde (the Green Cloister, so called because of the green cast of the frescoes that covered its walls) of Santa Maria Novella; they represent episodes from the creation. 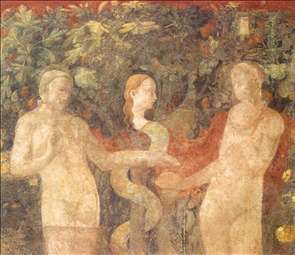 These frescoes, marked with a pervasive concern for elegant linear forms and insistent, stylized patterning of landscape features, are consistent with the late Gothic tradition that was still predominant at the beginning of the 15th century in Florentine studios and have given rise to the hope that Uccello s artistic origins may yet be found in some of these studios. From 1425 to 1431, Uccello worked in Venice as a master mosaicist. All his work in Venice has been lost, and plans to reconstruct it have been unsuccessful. 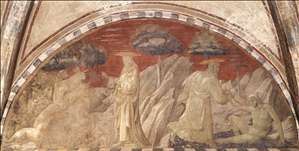 Uccello may have been induced to return to Florence by the commission for a series of frescoes in the cloister of San Miniato al Monte depicting scenes from monastic legends. 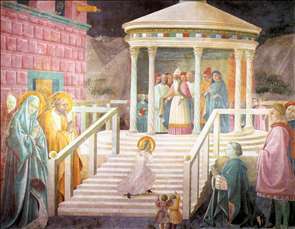 While the figural formulations of these ruinous frescoes still closely approximate the Santa Maria Novella cycle, there is also a fascination with the novel perspective schemes that had appeared in Florence during Uccello s Venetian sojourn and with a simplified and more monumental treatment of forms deriving from the recent sculpture of Donatello and Nanni di Banco. In 1436 in the Florence cathedral, Uccello completed a monochrome fresco of an equestrian monument to Sir John Hawkwood, an English mercenary who had commanded Florentine troops at the end of the 14th century. In the Hawkwood fresco, a single-point perspective scheme, a fully sculptural treatment of the horse and rider, and a sense of controlled potential energy within the figure all indicate Uccello s desire to assimilate the new style of the Renaissance that had blossomed in Florence since his birth. 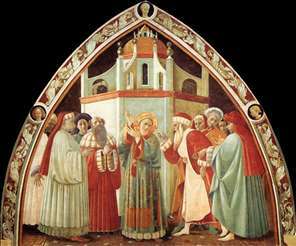 Following the Hawkwood monument, in 1443 Uccello completed four heads of prophets around a colossal clock on the interior of the west faade of the cathedral; between 1443 and 1445 he contributed the designs for two stained-glass windows in the cupola. 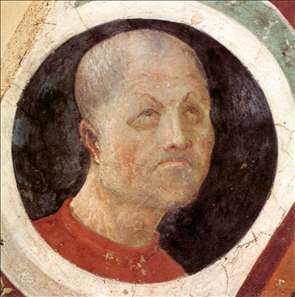 After a brief trip to Padua in 1447, Uccello returned to the Chiostro Verde of Santa Maria Novella. In a fresco illustrating the Flood and the recession, Uccello presented two separate scenes united by a rapidly receding perspective scheme that reflected the influence of Donatello s contemporary reliefs in Padua. 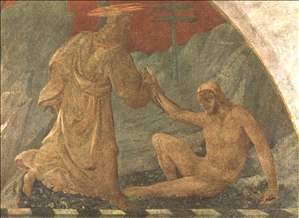 Human forms in The Flood, especially the nudes, were reminiscent of figures in Masaccio s frescoes in the Brancacci Chapel (c. 1425), perhaps the most influential of all paintings of the early Renaissance, but the explosion of details throughout the narrative again suggests Uccello s Gothic training. More than any other painting by Uccello, The Flood indicates the difficulties that he and his contemporaries faced in attempting to graft the rapidly developing heroic style of the Renaissance onto an older, more decorative mode of painting. Perhaps Uccello s most famous paintings are three panels representing the battle of San Romano, now in the Louvre, Paris; the National Gallery, London; and the Uffizi, Florence. These panels represent the victory in 1432 of Florentine forces under Niccolò da Tolentino over the troops of their arch rival, Siena. 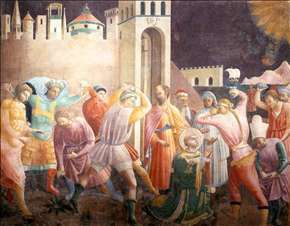 There are Renaissance elements, such as a sculpturesque treatment of forms and fragments of a broken perspective scheme in this work, but the bright handling of colour and the elaborate decorative patterns of the figures and landscape are indebted to the Gothic style, which continued to be used through the 15th century in Florence to enrich the environments of the new princes of the day, such as the Medici, who acquired all three of the panels representing the rout of San Romano. Uccello is justly famous for his careful and sophisticated perspective studies, most clearly visible in The Flood, in the underdrawing (sinopia) for his last fresco, The Nativity, formerly in S. Martino della Scala in Florence, and in three drawings universally attributed to him that are now in the Uffizi. These drawings indicate a meticulous, analytic mind, keenly interested in the application of scientific laws to the reconstruction of objects in a three-dimensional space. In these studies he was probably assisted by a noted mathematician, Paolo Toscanelli. Uccello s perspective studies were to influence the Renaissance art treatises of artists such as Piero della Francesca, Leonardo da Vinci, and Albrecht Drer. Uccello apparently led an increasingly reclusive existence during his last years. Uccello was long thought to be significant primarily for his role in establishing new means of rendering perspective that became a major component of the Renaissance style. The 16th-century biographer Giorgio Vasari said that Uccello was "intoxicated" by perspective. Later historians found the unique charm and decorative genius evinced by his compositions to be an even more important contribution. Though in ruinous condition, they indicate the immense difficulties faced by artists of his time in taking advantage of new developments without giving up the best in traditional art. See more details about "Creation of Adam"
See more details about "Disputation of St Stephen"
See more details about "Stoning of St Stephen"
See more details about "Mary's Presentation in the Temple"
See more details about "Creation of the Animals and Creation of Adam"
See more details about "Creation of Eve and Original Sin"
See more details about "Creation of Eve and Original Sin "
See more details about "Roundel with Head"
See more details about "Sts Paul, Francis and Jerome"